As I mentioned, it’s been an unusual fire season. A burst of activity early, then the monsoons arrived in Arizona. Flying in from the East, the mountains appeared green, instead of the usual earth tones. I’ve seen green grass all the way from Arizona to Oregon. There is the usual discussion of the future weather….those of us who fight fire both hate it and love it. We don’t like to see the destruction, but if there were no fires, we’d have no job. The discussion on the porch of the tanker base has about as much reliability as the National Weather Service. 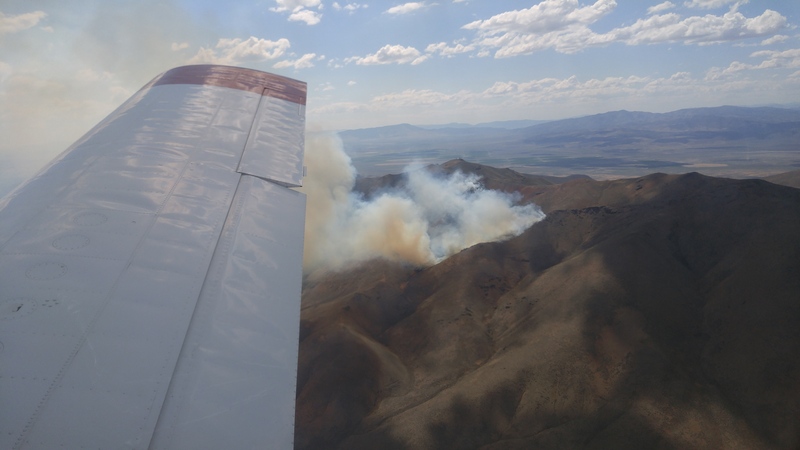 Two weeks ago I had one little burst of flying on two small fires in northern Nevada, but since that time I have been to Reno, to California, and have not flown a fire. The daily routine has become one of getting coffee, packing (you always take your stuff with you, never know if you’ll end up back at the same hotel that night or not), getting some nutritionally suboptimal breakfast (typically a sausage biscuit, if we’re lucky enough to be in a town that has a McDonald’s, sometimes just what’s to be had at the local gas station), head to the tanker base and get ready. “Getting Ready” is the best time of the day. Even in Nevada, it’s cool, the visibility is great, the mountains are beautiful, and the skin of the plane hasn’t had time to get hot yet. Covers come off, tie-downs are removed, pre-flight is completed, and we’re ready by “show-time”. “Show time” is the appointed hour by which we are supposed to be ready to go, and when we go on duty. Most of the time it’s 0900, occasionally 0800. I’ve had one dispatch last year at 0830, but usually fire behavior is such that fires don’t really pick up until the heat and the wind get going during mid-afternoon. 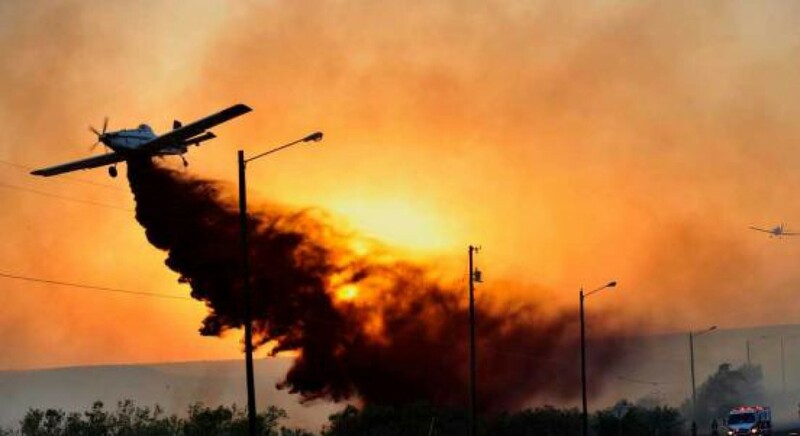 The plane looks good, the “mud” (retardant) that clings to the bottom of the plane give it a distinct, pleasant earthy smell to contrast with the oily smell of jet fuel. Briefing occurs, and then we wait. Not long after briefing discussion of lunch ensues, as it’s the next thing on the horizon. I usually walk the ramp for 45 minutes or so, trying to get some exercise before it gets too hot. Lunch is secured, then a nap, then a while of watching the clouds, then the evening ritual of tying the plane down, putting on covers, and heading back to the motel, in order to unpack in the same room where you packed your bags this morning. The daily routine has become very routine. There’s always someone discussing how he “coulda/shoulda” not come on fire season this year, and someone who is unhappy with his wife/girlfriend, and usually a discussion of some form of “male therapy” (translation: hunting, fishing, “I saw the biggest buck”, “I flew the worst plane”, etc.). After morning briefing yesterday, I walked down to the 802 and climbed aboard. Early still, I pulled out the manual and started revising a weight and balance program on my phone. Weight and balance computations are important, and we do them by hand, or occasionally by smart phone. With a new program, I’m trying to enter values to speed up the process. Deep within thought, I hear a turboprop engine start. I look out around the plane, and the other 802 on the field is firing up. Brilliant thinker that I am, I figure that a dispatch isn’t long behind. I hoof it down to the tanker operations building, and just as I’m walking in I’m handed a dispatch. The coordinates are entered, and the fire isn’t too far away. By now the first plane is out and gone. I taxi to the loading dock, get my 700 gallons of mud, and off I go. The base I’m working from is 4500 feet above sea level, and the fire is over a ridge that requires 9000 feet to clear. The first air tanker has dropped, and the Air Attack and I arrive simultaneously. He asks for a load across the top (head) of the fire where it is near the ridge top. (in the picture you can see where the fire is climbing the hill). I set up to run from the southwest to the northeast along the hottest part of the fire. Air Attack gives me a “Perfect!” over the radio, and I make my way back to the base for a “load and return”. I do four loads, and on the last load I have a hold over the fire while a couple other tankers drop, and a dozer is moved out of the way. Watching a dozer move up and down the side of a hill that I don’t think I’d try to walk on amazes me. Not only is he moving, he’s creating “line” (a vegetation free zone to slow the fire) as he goes. Due to the time holding, I feel it’s the better part of valor to buy gas. I’ve been watching, and each round-trip to the fire has burned 50-55 gallons of fuel, and I still have 120 gallons. However, there’s not another airport nearby, and if something happened I could end up with a low-fuel state. Besides, I need to go to the bathroom…. Fueled up, and climbing back into the 802, I see my driver/loader coming over as I start the engine. He hands me a sandwich, and a bottle of water. It’s now about 4 in the afternoon, and I’ve not had lunch yet, so it tastes delicious. I eat it as I load the next 700 gallons, and off to the fire I go again. This time we are putting retardant downhill. The hillside is so steep that even though I cross the ridgeline at a minimal airspeed, and I cut the throttle to idle as I push over the ridge, airspeed builds entirely too quickly. I drop the load, and make my exit down the valley. It feels so good to be in the rhythm of flying, loading, dropping, landing, and just being in the machine again. The air over the mountains is turbulent, but tightly strapped in I just bounce along with the plane. (I’ve chuckled at the advice given in aviation magazines about flying in the mountains. “Always fly in the early morning or late evening, as it’s entirely too turbulent to fly in mid-day”. Of course, most of our flying is mid-day. After a total of six loads, we are “held”. All the tanker activity stops, and the porch-sitting resumes. I fuel again, “just in case”. Word comes out that we are being held until 9 pm. That is welcome, in that we get paid for “extended time”, i.e., any time that we work beyond the usual 6 pm. As a bonus, an evening meal is provided for us, which is welcome as well. We receive “per diem” money, and so if we can avoid purchasing a meal, and can find cheaper motel rates, we actually can get our expenses down below what we are reimbursed, which gives us a bit of extra pocket money. Pumpkin time (the hour by which we absolutely must not fly) is 2043. Pumpkin time is determined by the official aviation almanac (and probably dried deer bones), and is set at 30 minutes after official sunset. It varies by location (yesterday had almost a 15 minute difference between two nearby stations…go figure). By 2015 it was getting dark. By 2030 the crew that provides the mud was headed out. No way were we going to fly by now. We couldn’t even get the planes started, off the ground, and back by Pumpkin time. Straps were put on, planes were secured. At 2050, in pitch black darkness, the SEAT manager left. As he was leaving, we asked if we were free to leave. He pointed at the clock…. “You’re paid until 9 pm, you stay until 9 pm”. We’re back in the saddle again. “You’re paid until 9pm. You stay till 9pm.” This might have just summed up 99% of SEMGs in less than 10 words! Love the updates…keep ’em coming.